"A delicious fried rice. You can use either chicken, pork, bacon or seafood - great with calamari and prawns." Heat the oil in a wok or large skillet, over medium-high heat. Fry the garlic until golden, then add the chili pepper and chicken meat, and stir-fry until cooked through. 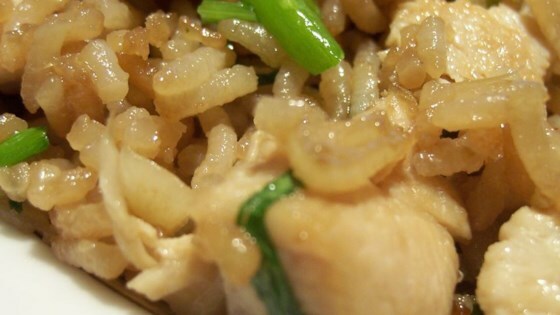 When the chicken is cooked, add the rice, sugar, fish sauce, and soy sauce. Cook over medium heat, stirring gently. When the mixture is well blended, stir in the green onions, basil, and cilantro. Cook for 1 more minute, then serve hot.